There is no deny fact that mobile device like cellular phones and tablets are far more affordable than desktops and laptops, and an average Indian consumer doesn’t have much disposable income in his hand to buy high end devices. Plus, one doesn’t even really need expensive smart phones to shop online or make mobile transactions. Moreover, due to their mobility and affordability, even tablets are high in demand in India. Mobile phones give the freedom to do things like shopping, booking tickets, making hotel reservations, search information online and etc. In India the young consumer are so high, who want fast instantaneous processes on the move. One doesn’t need to wait to reach home or to a cyber cafe to pay bills or make an urgent purchase online. M-Commerce customers are not bound by limited wired and WiFi Internet connections. In the last 3-4 years, the number of users who access the Internet through a 3G/2G connection has grown to round 22 Millions. Now compare this with the 15 Millions fixed lines broadband connections accrued over the last 17 years, there is a notable difference. Even though eCommerce has spread its roots throughout the country, it still hasn’t reached the places where people have no broadband or no computer. mCommerce could and will change this. 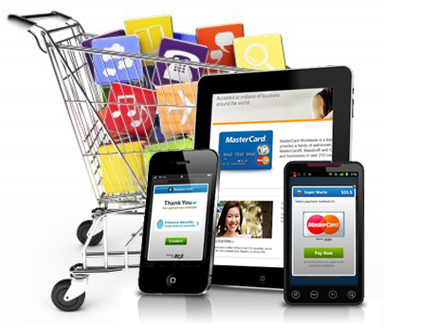 Mobile Payments is a new mode of payment as an alternative to traditional methods like cash, cheque credit cards etc. A customer can use a mobile phone to transfer money or to pay for goods and services. A mobile payment could be made by an app, data connection, IVR and even SMS, so anyone who has a bank account can make a transaction. This could aid in reducing cash-dependencies of people, particularly in rural India. For ex. Using Airtel Money you can shop online. Mobile platforms are still relatively free from viruses and other threats. And even in case of a fraudulent activity, credit tracking by GSM/GPRS/GPS is easy and quick. Thus increasing the credibility, and giving better assurance to the sceptical India population. Also, seldom do people part from their phones, so there are less chances of misuse of login information that may happen on computer systems. The problem with online advertising is that people have to be ‘online’ to view it. Several eCommerce players in India have come out with TV commercials to advertise their websites. However, mobile is a better platform to do the same. Even with Government’s regulation on bulk messaging, companies could still target a mass of people collectively by sending promotional content via SMS if a user hasn’t activated the DND service or wants to receive those ads. In a true sense Personal Computers are not really personal. Desktops and even laptops are shared by multiple people living in the same family or working together in an office. However the same isn’t true in case of cell phones. Whichever strata of the society a person may belong to, a phone has become an indispensable extension of oneself. People are more comfortable using their phones for various activities, as it gives them a sense of privacy and security, while offering easy usability. Since already there is way more mobiles in India than computers, mCommerce could gradually grow bigger than eCommerce. Developing an iPhone App – is it advantageous for your business? Why Should You Use LinkedIn For B2B Lead Generation?